Large Scale Central - Advanced Forum Detail Topic - Retired, is there anybody left? Topic: Retired, is there anybody left? I've been out of the garden railway scene for a while but now that I'm retired I have a renewed interest. Looks like things have changed in the last couple of years. I guess the loss of some of the manufacturers is taking us back to the scratch build everything days. Maybe that's not a bad thing. Welcome back. Since I am a scratch builder I don't mind. But I think you are right. This is kind of a niche hobby and G scale is a niche within a niche. If we don't have the manufacturers it will be an interesting hobby. A lot is being recycled through Ebay, auction houses and hobby shops. I agree with John. Even Star Hobby has said they are getting more Collections as the Grandkids get rid of "Grandpa's Old Trains". I don't expect we will see much "new" stuff as all of the good old ideas were used up. And the prices of the used items is much less than the new items. I am fortunate enough to live in an area where there are many train shows and even auctions with awesome buys!! Whereas here in UK the cost of used is often more than new. I've been to two large-scale shows in the last six weeks, and have been horrified to see damaged Bachmann freight cars, missing roofwalks and brake stands, for sale for around $90. LGB stuff? Really best not to ask. And live steam locos at the same price as new. This business of selling off Grandpa's old trains isn't limited to model trains. About five or so years ago, I hit upon a similar opportunity in my line of work. In Holland, Denmark, Norway the old people who owned the old estates were dying off, and when their kids and grandkids inherited their estates one of the first things they did was look at the walls and say, "Get these old paintings outta here!! Now!!" Well, I developed a relationship with an artist in Holland who had a nice little side business buying up art from these estates. She would ship them to me, I would clean 100-150 years worth of yellow varnish and cigar and pipe smoke off them (ah, smoking indoors, the good old days! but no kidding, some of them came almost black) and sell them in my gallery. No one was more surprised than I was to be selling seascapes, ships/boats, harbor scenes, old town scenes, shepherds in the fields, than I was. This is the Rocky Mountains and the nearest ocean place is like two thousand miles away. But it worked and I made a lot of money. Then the supply dried up. Then the prices started going up. It got to full retail and I had to stop selling them; you can't buy at full retail and sell at retail and make any money. Maybe that will happen here eventually, I don't know. Maybe that's what's happening in England that Tac Foley is describing. There is an ample supply of G scale on ebay, much of it new or very lightly used, USA Trains is still producing, Piko and Marklin/LGB are still producing. True, some of the scarce road names or models can be pricey, but you can get lots of good deals. Also, the for sale groups on facebook are another place to get trains. I don't see a large increase scratchbuilding locos, but maybe bashing some rolling stock, or customizing it. I 100% agree with Greg. It’s out their.. Be patient. It will show up eventually If it’s something specific you are looking for. Look at the Facebook Marketplace, rather than just the G scale groups. Many folk don't notice there are specialist groups and they just list the stuff, usually with the wrong title. Try searching for G gage, or G scale, or LGB trains. The most frustrating thing from a kitbashing/scratchbuilding perspective is the lack of motor blocks for bashing. It's hard enough to find drives for gas/diesel engines, forget large steam unless you want to cut and mill everything. I'm buying a lot of things simply to have them before they get priced completely out of reach for me. Vic, I'm not sure it is quite that bad. 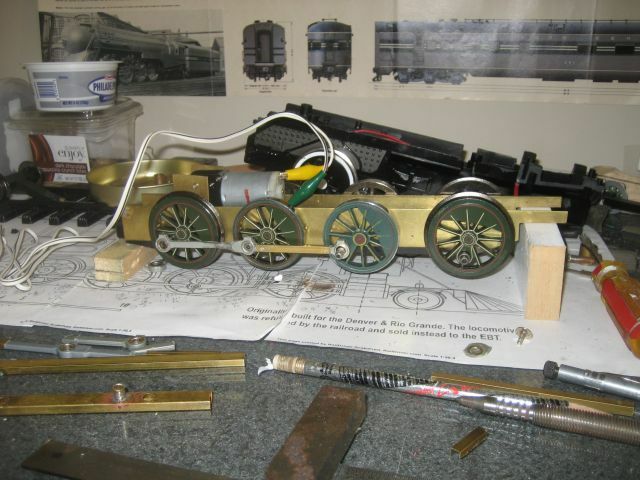 I build a 2-8-0 as an experiment using conventional smaller-scale techniques. No mill - just a $99 vertical drill press from HD. Brass strip for the sideframes. Wheels borrowed from a plastic model (B'mann 4-6-0 in this case.) New siderods to match the spacing, and a rocking frame on the front axle for equilization. It worked. Yea I did that with spare parts. I bought several Aristo Delton classic trucks when Aristo was in it's death throws. I still buy some stuff at auction, because its at give away pricing, just to have a spare parts inventory. I have all the equipment and projects I need, but its nice to have the spare parts to keep stuff running. As a side note, GLX produces many spare parts for Aristo products, and I have purchased more then just a few parts from GLX.